As I looked at my daughter’s illustration, I knew what I had to do. The questions was, “How?” How was I going to get organizations to sponsor a book to raise funds for the Red Cross? This was the question I pondered on the morning of September 11, 2001. Clearly, a book designed to give a voice to our nation’s smallest citizens in the aftermath of the September 11 terrorist attacks was a good idea. For $5,000 organizations would not only help fund the book’s publication, employees’ children would be given opportunity to submit illustrations for the book. Plus, the logos of all sponsors would appear on the back cover and each sponsor could include a special message inside the book. On the morning of September 11, 2001, I was where I usually am on a Tuesday morning — seated at my desk at the marketing agency where I work as a writer. Suddenly, one of my colleagues came rushing into my office in tears. “A plane just crashed into a building in New York City,” she cried. As my colleagues and I gathered around the boardroom television, all I could think about was my children. I needed them close. So I left work to collect them from school. The next thing I recall is being in my car driving past the Toronto airport. As a plane flew overhead, I remember physically crouching in my seat. With my children safely in my car, I rushed home and turned on the television. I watched in horror as the events of that fateful morning unfolded before my eyes. Then I realized, to my dismay, my children were sitting on the floor watching too. I immediately shut off the television and joined my children on the floor. I asked my daughter, who would be celebrating her 8thbirthday in a few days, how she was feeling and if she had any questions. Not surprisingly, she was unable to articulate the thoughts swirling in her head. So I asked her to draw me a picture of what she was thinking about. She proceeded to draw a picture of one of the twin towers. 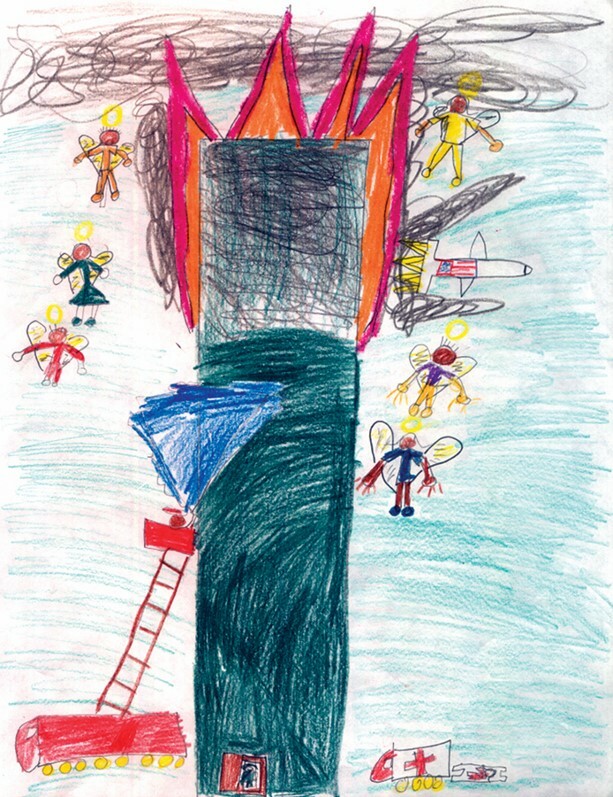 She drew people jumping from the tower. My heart sank. I then watched her tiny hand draw little wings on each person. She saw them as angels. My eyes filled with tears. At that moment, I knew I had to create a book that would give Canadian children opportunity to share their emotions and insights … and give organizations an opportunity to give of themselves and their employees. All proceeds from the sale of the book will go to the Red Cross U.S.A. Appeal. Will you be a sponsor? Needless to say, we got our sponsors. 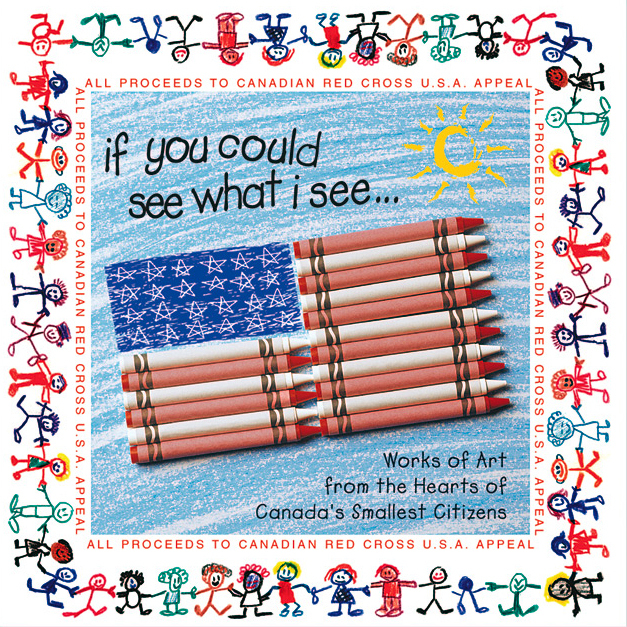 I partnered with the generous hearts at MAD Marketing + Design (my employer at the time) and together we created If you could see what I see… The book was to market in six weeks and in short order, we raised $58,000 for the Canadian Red Cross. The book is now part of the collection at the National September 11 Memorial & Museum in New York City.